A science fiction writer takes a look at the medium-term implications the information processing revolution holds for human civilization. 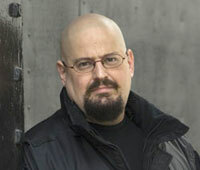 Charles Stross, 46, is a full-time science fiction writer and resident of Edinburgh, Scotland. The winner of two Locus Reader Awards and winner in 2005 and 2010 of the Hugo Award for best novella, Stross's works have been translated into over a dozen languages. Like many writers, Stross has had a variety of careers, occupations, and job-shaped catastrophes in the past, from pharmacist through tech sector journalist to first code monkey on the team of a successful dot-com startup. He has degrees in pharmacy and computer science. Dave Aitel, CEO of Immunity, Inc.
None of these is true. This talk explains why. "Why doesn't my browser do X?" Competition among browser vendors is fierce, and it seems that everyone has an idea for how to make Web browsing faster, easier, and more secure. But only a small fraction of the published research on Web security is ever adopted by popular browsers. In this talk we'll discuss what it takes to transition a research idea into a mainstream browser feature and the pitfalls that lie in wait along the way. Collin Jackson is an Assistant Research Professor at Carnegie Mellon University, based on the Silicon Valley campus. His Web security proposals have been adopted by many popular browsers, including Internet Explorer, Firefox, Google Chrome, Safari, and Opera. He has also proposed plenty of ideas that have gone absolutely nowhere. Don't miss the USENIX Security '11 Reception, featuring dinner, drinks, and the chance to connect with other attendees, speakers, and conference organizers. Building on last's year success, we will host a rump session on the evening of Wednesday, August 10, 2011. This is intended as an informal session for short and engaging presentations on recent unpublished results, work in progress, or other topics of interest to the USENIX Security attendees. To submit a rump session talk, email sec11rump@usenix.org by Wednesday, August 10, 2011, at 11:59 a.m. PDT. Security research has often had a major impact on technology policy...and vice versa. Within the privacy space, issues such as location privacy, lawful intercept, and online tracking have been the subject of considerable debate. As a "tame technologist" within the Canadian civil service, I've been deeply engaged in these subjects at a practical level. In this talk, I will outline some of the ways in which the spheres of technology, policy, and law intersect, illustrated with recent real-world examples from the privacy domain. Tara Whalen joined the Office of the Privacy Commissioner of Canada (OPC) in 2009, where she works as an IT Research Analyst. Prior to joining the OPC, she conducted post-doctoral research in computer security at Carleton University. She has a PhD in Computer Science from Dalhousie University. Tara has over 15 years of experience in the information security and privacy fields, including roles in research labs, academia, federal government institutions, and the private sector. In addition to privacy, her research interests include the human factors of security and the social implications of technology. In this talk, I will link two of my favorite research streams: (1) the behavioral economics of privacy, and (2) mining of data from online social networks for privacy and security risks associated with online disclosures. I will highlight how research in behavioral economics can help us make sense of apparent inconsistencies in privacy (and security) decision-making and will present results from a variety of experiments conducted at Carnegie Mellon University. Then I will discuss the technical feasibility and privacy implications of combining publicly available Web 2.0 images with off-the-shelf face recognition technology, for the purpose of large-scale, automated individual re-identification. Combined, the results highlight the behavioral, technological, and legal issues raised by the convergence of mining technologies and online social networks and illuminate the future of privacy in an augmented reality world. Alessandro Acquisti is an Associate Professor of Information Systems and Public Policy at the Heinz College, Carnegie Mellon University, and the co-director of the CMU Center for Behavioral Decision Research (CBDR). Alessandro has been the recipient of many awards, and his research on privacy has been published in leading journals across multiple disciplines and featured in media outlets such as the New York Times, the Wall Street Journal, the Washington Post, CNN, and NPR. His 2009 study on the predictability of Social Security numbers contributed to the change in the assignment scheme of SSNs that was announced in 2011 by the US Social Security Administration. Last year, my colleagues and I were accused by unnamed intelligence officials of being a "foreign conspiracy" to destabilize a major democracy and narrowly escaped being thrown onto an airplane and deported from that country—all for publishing a research paper (Wolchok et al., CCS 2010). In this talk I will share this story and other research adventures from my work in DRM, electronic voting, and Internet censorship—areas that lie at the intersection of technology and political power. These topics touch on computer security issues that affect the relationship between individuals and government, and scientists working to understand these issues have an obligation not only to speak truth to power but also to explain technical realities directly to the people. We will travel from Manhattan alleyways to Mumbai jail cells, meeting powerful foes and making lasting friendships along the way. J. Alex Halderman is an assistant professor of computer science and engineering at the University of Michigan. His research spans applied computer security and tech-centric public policy, including topics such as software security, data privacy, electronic voting, censorship resistance, digital rights management, and cybercrime, as well as technological aspects of intellectual property law and government regulation. Don't miss the cool new ideas and the latest preliminary research on display at the Poster Session. Take part in discussions with your colleagues over complimentary drinks, pizza, and salad. Check out the list of accepted posters. The EFF SSL Observatory project collects and publishes comprehensive datasets of the TLS/SSL certificates used by servers on the public Internet. These datasets provide numerous insights into the ways cryptography is used on the Web and the collective role of Certificate Authorities (CAs) in authenticating Web servers. This talk will review previous findings from the project's scans of port 443 in IPv4 address space and will present several new results. It will also describe the design and initial findings from the new, decentralized version of the Observatory. Peter Eckersley is a Senior Staff Technologist at the Electronic Frontier Foundation. His work at EFF has included privacy and security projects, such as Panopticlick, HTTPS Everywhere, Surveillance Self-Defense International, and the SSL Observatory, and running the first controlled tests to confirm that Comcast was using forged reset packets to interfere with P2P protocols. Peter's PhD at the University of Melbourne was on digital copyright and alternatives to digital copyright. Jesse Burns is a Principal Partner at iSec Partners, an application security consulting firm. His clients include many of the world's largest technology, telecommunications, and financial services firms. Session Chair: Niels Provos, Google, Inc.
SSL/TLS Certificates: Threat or Menace? Moderator: Eric Rescorla, RTFM, Inc. The security of SSL/TLS as used in practice depends on the security of the certificate hierarchy used to authenticate the servers. However, recent events have called the adequacy of that system into question: typical browsers trust a large number of root certificate authorities (trust anchors), and compromise of any of those anchors leads to the ability to impersonate more or less any server, as was demonstrated by the recent Comodo incident. Our panelists will talk about the state of the SSL/TLS authentication system, its future, and the various proposals for improvement and/or replacement. Passwords are no longer acceptable as a security mechanism. Memorable, unguessable, high entropy, regularly changed, never written down, and all different . . . a contradictory and unsatisfiable set of requests! Solutions have been offered for Web authentication; to users, though, non-Web passwords are just as annoying. I propose a portable gadget called Pico to get rid of passwords everywhere, not just online, transforming "what you know" into "what you have." Maybe your gut reaction to the controversial Pico will be "it'll never work," but I believe we have a duty to come up with something more usable than passwords. Session Chair: Diana Smetters, Google, Inc.
With a healthy dose of technologies and techniques borrowed from big-data companies such as Google and Facebook, engineers in the security industry have led a sea change in how security products are designed and implemented. Rather than rely upon ad hoc threat detection networks and loose partnerships with other security firms to detect new threats, security firms are moving to cloud-based product models, where threat information for malicious network traffic, malware, and various forms of attacks is centrally aggregated and processed from endpoints. Large teams of analysts-focused manual identification of threats are now being displaced by data mining and machine learning, pushing the effective time to live of an attack from weeks to hours. In this talk I will show you how it's been done.